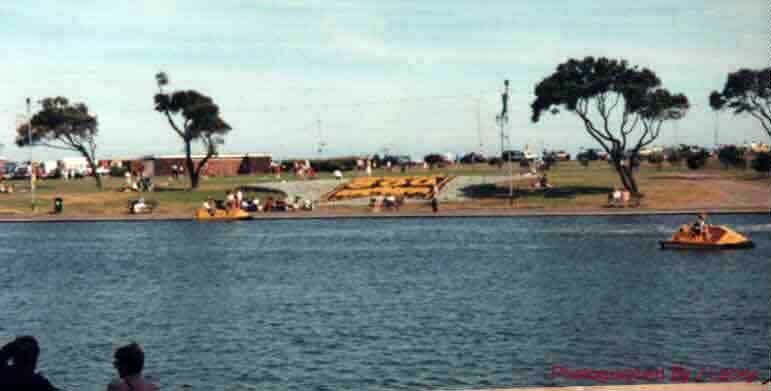 The Canoe Lake is about a five minute walk from Southsea common and so has been included in this section. The Canoe Lake has got a lake where peddle boats can be hired out for pleasure. There are often many ducks and swans which you can feed. The grass area next to the lake can be used for ball games or kite flying. A crazy golf course is located near the lake and there is a cafe for refreshments. Southsea Model Village can also be found close to the canoe lake and Cumberland House, a natural history museum, is also only a few minutes walk. The Rose Gardens are located along the back of the Canoe Lake which can be used to get some peace and quiet. There are often some unique flower arrangements in the gardens round the edge of the canoe lake. In the centre of the above photo you can see an arrangement for Portsmouth 800. The Canoe lake dates back to 1886 when it was opened by Mayor A.S. Blake and is home to some mature evergreen oak trees planted in 1910. The Canoe Lake is sometimes known as a swan's nursery because it is one of the Mute Swans chosen sites in the Solent. There can by up to 60 juvenile swans in the area at any one time.